We're sorry but we couldn't find that post. Israeli financier and former IDF fighter pilot Tal Keinan, author of God Is In The Crowd, explains why he sees American Jewry on the decline and in danger of "dying in its sleep," and offers suggestions for revitalizing Jewish life today. Come join us at our annual Mother's Day Sponsor-A-Child Luncheon & Bazaar featuring Gregor Collins an American author, actor, speaker and contributor, best known for writing the memoir "The Accidental Caregiver: How I Met, Loved and Lost Legendary Holocaust Refugee Maria Altmann". The woman that inspired the movie "A Woman in Gold". On April 25 at 8:30 am at Buchanan Ingersoll & Rooney PC (One Biscayne Tower Two South Biscayne Boulevard, Suite 1500), join us for quality time with a true expert. Ask him everything you wish you had time to ask your pediatrician. Learn the secrets to getting your baby to sleep through the night and so much more! RSVP here: https://jewishmiami.org/resources/community_directory/events/rsvp/pjlibrary_sleep_other_hacks_free_rsvp/. 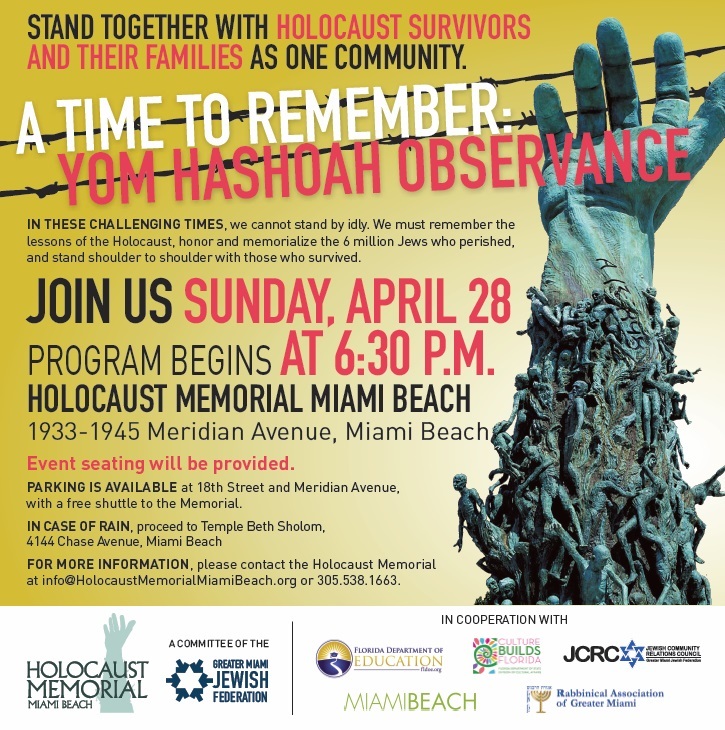 Join the Greater Miami Jewish Federation and the Holocaust Memorial Miami Beach on Sunday, April 28 at 6:30 p.m. to commemorate Yom HaShoah — Holocaust Remembrance Day. The powerful program includes an eyewitness account from a survivor, a candle lighting ceremony and musical selections. Enjoy dinner, dancing, music, a silent auction including artwork from our preschool program and lots of fun to benefit the Shirley and Chester Paul Special Needs Program. This year the Special Needs Committee is honoring Renee and Mel Greenstein for their unwavering dedication to the Shirley and Chester Paul Special Needs Program and their continuous support of programs at the JCC. Join hundreds of people to honor dedicated individuals for their service to the Jewish community and elect new leadership at the Greater Miami Jewish Federation’s 81st Annual Meeting on Friday, May 31 at Hilton Miami Downtown, 1601 Biscayne Boulevard. Celebrate Israel Independence Day at the J! Thursday, May 9 from 5:30 pm - 7:30 pm, join us for Israeli Dancing & Music, Make your Own Hummus, Arts & Crafts, Climb Masada, Bounce Houses and more. Israeli Style Dinner for purchase. Fun for the entire family. This year, we are proud to host Hadassah Itzhak, Artist in Residence from Yerucham, Israel. Hadassah will be sharing her techniques in the art of Moroccan Tile Painting and helping the MBJCC to create a lasting art installation for our center. Tickets may be purchased at mbjcc.org/israel or call Daryl Johnson, Special Events Coordinator at (305) 534-3206 x234.